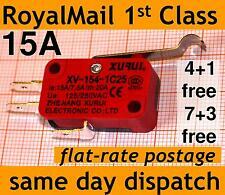 New 15A microswitch (SPDT) with r shaped lever attached (simulated roller lever). This is a high quality switch which works very precisely. Lever Length: 28mm. Buy 7 get 3 free! I get these switches directly from the manufacturer. MIKROSCHALTER AUS / Ein 8x8 mm 0,1A -30V Press Button Mini On/Off 1, 3, 5 pc. Plunger, lever and roller lever options. Actuator Type Roller Lever. Pre-wired with 500mm leads. Case Material Glass Fibre Reinforced Nylon. 1 x Honeywell Leaf Lever Microswitch, 16 Amp 250 Volt AC SPDT NO/NC. SPDT-NO/NC Long Hinge Lever Microswitch, 6A @ 250V ac. 1 x Saia-Burgess V3SYR1-UL IP-67 SPCO Roller Lever Microswitch, 5A@ 250V AC. Lot of 2: Schaltbau S804 Snap Action Limit Switch. Schaltbau Model: S804. 10A at 380V AC. Industrial Grade Snap Action Switch. Ultraminiature Microswitch Gold plate. 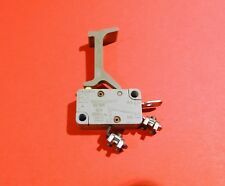 Burgess F5T8-GP; F5 Snap-action Microswitches Ultraminiature; Gold plate;. Burgess F5T8-GP 5A 250 VAC SPDT SnapAction. We will list them right away. 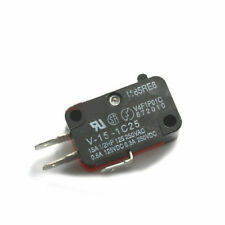 Microswitch 30VDC 0,1A 1,47N Pin. Very nice C-H Japan NO / NC Button Microswitch. SPDT - Single Pole Double Throw. Rated 5A 125-250VAC. Type no. 9126. Nice used condition, fully tested. 5A 125-250VAC. Single pole changeover operation m iniature micro switch. The AV series of anti vandal push button switches feature an anti-jamming construction and reduced travel to prevent insertion of foreign parts and are protected against crushing, are fire resistant and long life. 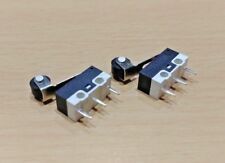 MIKROSCHALTER AUS / Ein 7x7 mm 0,1A -30V Press Button Mini On/Off 1, 3, 5 pc.